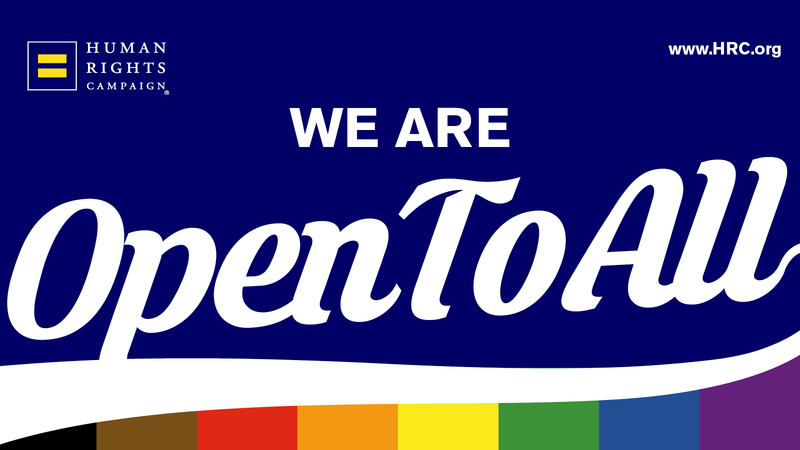 Today, HRC published a full-page USA Today ad featuring a sign that businesses across the country can display in their windows to show they are #OpenToAll. Following the decision by the Supreme Court of the United States in the Masterpiece Cakeshop v. Colorado Civil Rights Commission case, this sign will allow businesses to show their support for the LGBTQ community by proudly stating that their place of business will not turn away anyone based on who they are or whom they love. Click here to download a display sign of your own and for more information and additional resources on how to get involved following the Masterpiece ruling. HRC is continuing to fight discrimination in all its forms -- in communities across the country, at the ballot box and in court. This year, HRC is continuing its historic effort to elect a pro-equality Congress and to work toward ensuring lasting, legal protections for the LGBTQ community. In addition, HRC will continue to push for the passage of the federal Equality Act. The bipartisan Equality Act would provide clear and consistent non-discrimination protections on the basis of sexual orientation and gender identity across key areas of life, including employment, housing, federally-funded programs, public spaces and services, education, credit, and jury service. The Masterpiece Cakeshop case involved a baker who refused to serve a gay couple in violation of Colorado’s statewide non-discrimination law. Represented by the SPLC-designated hate group Alliance Defending Freedom, the baker — who lost before the Colorado Supreme Court — claimed that he should be able to discriminate against LGBTQ people on religious freedom and freedom of speech grounds. The Trump-Pence Administration filed an amicus brief in this case in support of the baker’s claim.